Maybe I'm crazy (my boyfriend certainly thought I was at the time) but I didn't just see a spider dungeon and THE ugliest burgundy-stained floor ever, I saw potential. 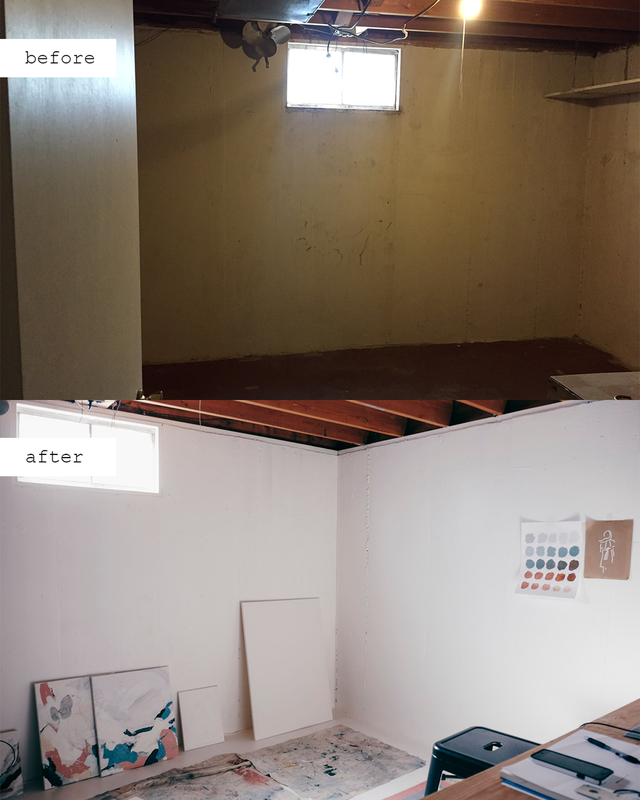 With a little (correction: A LOT) scrubbing and a few coats of white paint, I knew it could be the new home to my art practice. 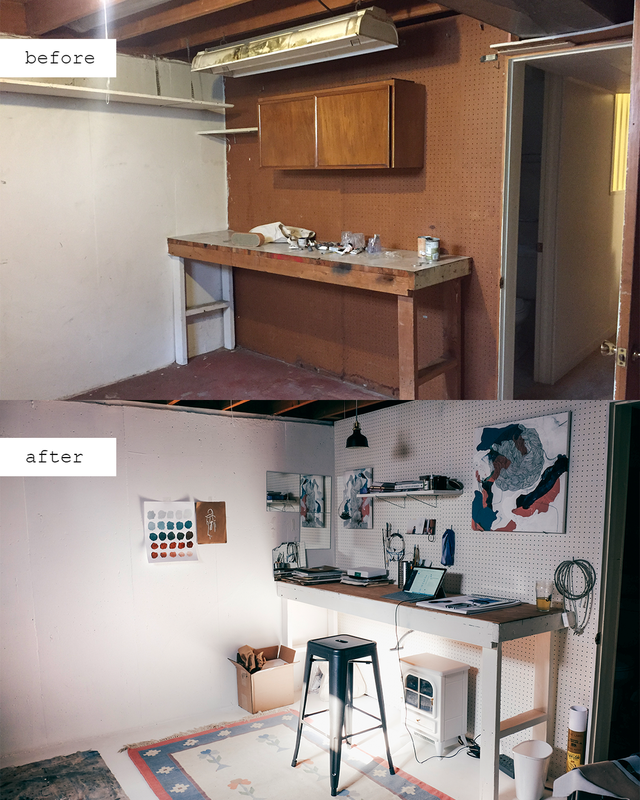 Removed EVERYTHING from the space -- old cabinets, shelves, light fixtures, and the table. One of the only thing I left was the vintagey metal fan, which would nearly cut my finger off while painting later. Deep cleaned. I scrubbed the walls down with antibacterial soap and hot water and swept all the cobwebs out of the rafters. Sanded floor and walls. This is essential to prep for painting! Swept and vacuumed x 10. You don't want dust on any surfaces before painting. Painted the floor and walls. (Paint listed/linked below). I laid down 4-5 coats on every surface since concrete is super absorbent. Sealed the floor (listed below). This puts a thin sheen over the paint, which makes it resistant to stains and easy to clean. Sanded + painted table. I also removed the laminate top and drilled on thin plywood (which they cut to size for me at Home Depot, easy!). Installed beetle kill pine wall. And that's it! I'm so happy with how it's turned out. Although one day I'd love to have a more airy, light-filled home studio, I love taking what you've got and making the most of it. Whether it's a dark old room in the basement or an empty corner of the living room, I always recommend others have a dedicated space for creative work. It's a game-changer! Please feel free to comment below with thoughts, questions, ideas!